Make a positive and immediate difference in the lives of orphaned Cambodian children.Due to non-existent government facilities and impoverished families unable to provide adequate care to the children, many orphans are left to fend for themselves. New Hope collaborates with various local NGOs to provide shelter and care for these orphans. As a volunteer in Cambodia, you’ll be giving love, care and attention to the children so that they can pursue a normal childhood. This project provides the orphans of Cambodia with a safe home that they can prosper in. By giving them an environment to facilitate education and personal growth, the children will be able to have secure futures, and in turn be able to create a better future for the country. If you enjoy working with children and creating a safe haven for them, then this is a fantastic project for you! While you’re here, enjoy the warm hospitality of the locals and explore the world-renowned Angkor Wat. Organizing extracurricular activities such as games, singing and teaching songs, art, playing music, etc. In our program, except our registration fee of $269,which we need to advertise, cover office expense and pay salary, volunteers pay their money directly to the host family and project (or country coordinator). This ensures that 100% of your money goes for you. In addition to our registration fee of $269, here you find the world's most affordable weekly program fee. If you enjoy working with children, then you will find this project extremely rewarding. There are many orphans in Cambodia. It is a resource-poor country, and too many families live in poverty. The orphanage is doing a wonderful job of providing food, education, housing and clothing for the children, but it faces many challenges, namely with finances and lack of staff. Your assistance with the orphanages will help to alleviate staff issues. By offering your time, energy and attention, you bring a whole new positive energy to the daily life at the orphanage. Your presence will not only help the center reach out to more orphans, you’ll be showing them a brighter and better future ahead. 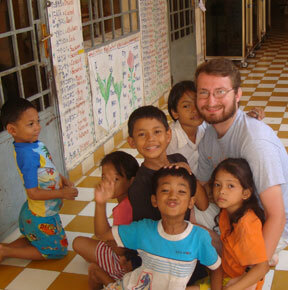 There are no specific qualifications needed to volunteer in the Orphanage program in Cambodia. However, volunteers are expected to be flexible and patient, as well as have much passion and love for children. Volunteers are also expected to have a basic knowledge of English in order to communicate with the project staff and the local people. Volunteers must be at least 18 years old and they must respect the rules and regulations of the center, be resourceful, and must not hesitate to become involved in different activities. This project is located in Phnom Penh, Battambang and Pursat. Chaotic yet charismatic, Phnom Penh is the capital city of Cambodia. Amid the apparent poverty and depravity of the people, lies a historical treasure trove worth exploring. For an eye-opening experience, visit The Tuol Sleng Genocide Museum (S-21 Prison) and The Killing Fields of Choeung Ek, relics of the plight and the suffering of the people under the hand of the Khmer Rouge. The magnificent Royal Palace, The National Museum of Cambodia and Wat Phnom are less-disheartening visits. Amidst the chaos, lies a laidback culture. Volunteers can take a pleasant stroll along the park-like riverfront, where plenty of cafes and restaurants are located - idyllic settings for you to kick back, relax and absorb the local culture. Battambang is the second largest town in Cambodia and a popular tourist destination. It is home to many nearby ancient temples, Buddhist shrines and the bamboo railway. Located next to the river, it is home to some of the best-preserved French colonial architecture in the country. Most of the colonial buildings can be found along the waterfront, and famous Art Deco buildings include the Central Market, the swimming pool Victory and the train station. The people are also charmingly friendly, making this town a lovely place to retreat to. The city is developing fast, but the hilltop temples and scenic villages can still be visited on leisurely daytrips. Pursat is a beautiful city well-known amongst travelers for its adept marble carvers and oranges. Nearby, the waterfall and floating village of Kompong Luong is an attraction. Pursat also offers perfect access to the Tonle Sap Lake and the massive Cardamom Mountains, a magnificent ecological wonder.